The College of Psychology celebrates the success of graduates who have undergone and passed the annual PRC Board Exam for Psychometricians. “The school provides our students four long years of mental and emotional preparation effective on their first day of school as they begin their journey in Southville. Active participation in worthwhile seminars apart from a fixed academic schedule greatly contributes to the broad expertise of our students,” shared Mr. Ruel Cajili, Dean of the College of Psychology, in an interview. Mr. Cajili commits to the school’s promise to be one with the world’s annual celebration of Mental Health Awareness Day every month of October. Southville conducts intensive monitoring from their stay at the review centers until the day of their exam. Psychology Alumni who are now registered Psychometricians are Carlene Alacazar, Dylan Vallestero, Nicole Suriaga, Pauline Pascual, Aura Olitoquit, Marco Tseng, Louise Principe, Christoff Graza, and Karisse Buenacosa. 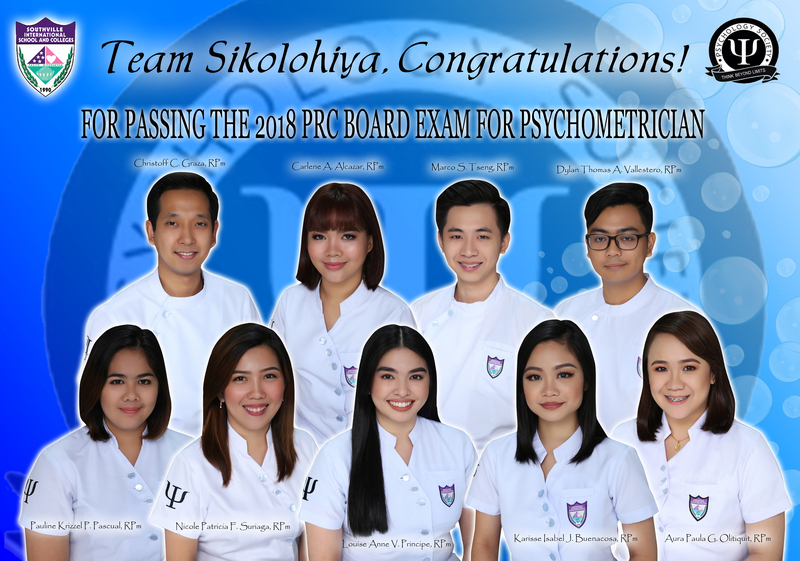 The board exam for Psychometricians was implemented only in 2013 and Southville alumni has been setting the bar high, keeping up with an acclaimed result since then.